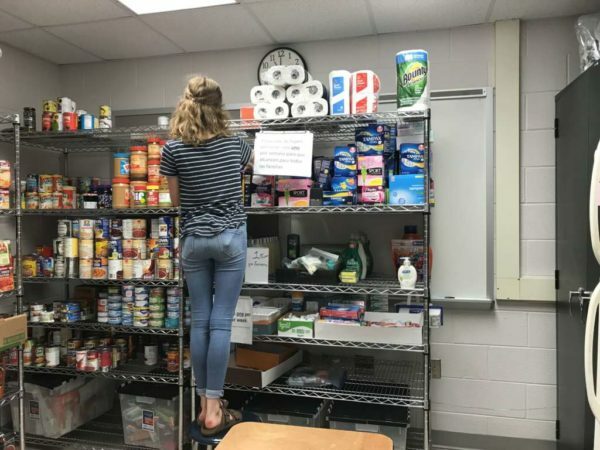 The food pantry at South Lakes High School is moving beyond the typical scope of community pantries that give students in need a chance to discreetely shop for food and toiletries. In the coming weeks, the pantry, which currently caters to students in the SLHS pyramid and is run by the school’s Parent Teacher Student Association, will begin offering cooking skills classes. The after-school cooking workshops will give students a chance to learn more about healthy eating. Through eight sessions during the school year on Wednesday afternoons, students will learn how to make one recipe using healthy ingredients and meal kits that do not rely on processed ingredients, according to Roberta Gosling, one of the founders of the pantry. The initiative is made possible by a $7,000 grant from the Washington Nationals Dream Foundation. The idea began to take root when Alana Pudner, a Girl Scout, approached pantry organizers with a three-meal pack she prepared to earn her Silver Award. Students began ordering the meal kit, which includes ingredients for veggie chili, lentil stew, and a tuna pasta casserole, as part of their weekly orders. “To take that further, we also looked at some of the broader trends and felt that if we could help students learn to cook healthy, budget-friendly recipes that it would equip a broad group of people with life skills and take students a step closer to nutritious choices,” Gosling said. Recipes will contain ingredients available in the pantry and through SNAP and WIC benefits. At the end of each session, students will get bags with recipes and ingredients, including a kitchen starter kit with basic tools like a cutting board, measuring cup, a pan, and spices used in multiple cuisines. Although the classes are open to all students at the school, organizers plan to market the class through the pantry to reach students most in need. Each session will accommodate about 20 students. Organizers are also making an effort to focus on foods from around the world. Shopping lists are available in English, Spanish and Arabic and participants will get a chance to try different cuisines in the classes. Roughly 30 percent of all SLHS students experience food insecurity, according to pantry organizers and volunteers. Every Thursday, students in need turn in their shopping list for the week. Volunteers pack shopping bags and distribute them to students as they head out on Fridays. Students can also shop at the pantry on Thursdays from 3-6 p.m. and on Friday from noon to 3 p.m. The pantry is also open in the summer on Thursdays from 3-6 p.m. Since April 2017, the pantry has filled more than 2,500 orders and weekly order averages are also increasing. Now, pantry organizers and volunteers are looking for new ways to make the initiative more sustainable and comprehensive. On September 30, the school’s PTSA will partner with Lake Anne Brew House to present the “Do It Your Way 0.5K.” All proceeds from the event, which is set for 4-6 p.m. at Lake Anne Brew House, will go to the food pantry. The pantry is led by Gosling, Abbe Pascal, Andy Sigle, Amy Shaw, and Sherri Pudner. Items in high demand include rice, beans, jelly, canned fruit, shampoo, conditioner, soap, toothpaste, and toothbrushes. Monetary donations are also accepted online.